I know some people have the same problem. My whole face has these very small flesh colored bumps on them. You can't see them in the pics like they are in real life. The thing is, with mine - most of them have what looks like a tiny flake of skin on them and it feels like a super small scab. If I squeeze, what usually comes out what looks like a small hard piece of wax. Yellowish. It comes out very easily, I hardly have to put any pressure on it. I read another place that if you leave your whiteheads in your skin for years, they'll become hard like this. The thing is, I could squeeze them all out every week and still have more. I had been treating the issue like a fungal infection, but after washing with Nizoral for a few weeks and seeing little improvement - I'm thinking that isn't what it is either. 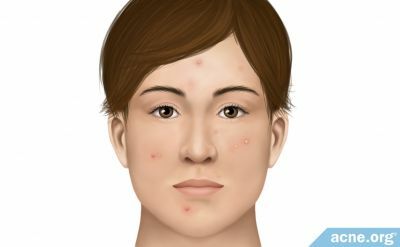 I've just started a no-wheat diet today, but am skeptical on this as my acne seems to be hormonal. I say this because it started at puberty and got better with birth control. Add to this that I seem to break out pretty bad once a month and moderately 2 weeks after that (this indicates female hormone cycles.) But the little bumps always stay. When I say I break out every two weeks, I'm talking about getting a handfull of big inflamed spots. Someone please tell me what this condition is that I have on my face and how to treat it. Accutane and birth control are out of the question at this point in my life. i have this poroblem as well. do aha/bha help, anyone? Arg, I know what you're talking about. I have a similar thing on my cheeks, around my jawline, and basically in my hairline beside my eyes. The only difference is that nothing happens when I squeeze mine, but they look basically the same. I can't get rid of them and I have no clue what do to about them, but if anyone finds out something, it'd be quite helpful. does it leave icepick scars? i had like one the other day, feels like a scab, so i eventually started picking at it and the result was a lil ball of dried wax i guess? left a lil hole but eventually closed up. i think this is due to clogged pores, but i dunno the exact terminology as you ignore it the buildup develops and leading to a oversized pore with guck in it; dried waxy ish. eventually leading to icepick scars, or so i think. I'll ask a derm friend about it. This is due to clogged pores. I have the same things you do, and they are annoying! Do not try to squeeze them out; right now you won't be able to get to the root of the problem (it won't go away and might become an inflamed pimple) and you'll just create a red mark. Right now I'm using Paula's Choice 2% BHA and it's helping a lot. Some of the flesh-colored bumps have come to the surface and I've gotten rid of them. For the really stubborn ones, I'm starting to use Green Cream (thanks to Lionqueen). Hopefully it'll get rid of the last ones. have you thought about exfoliating gently, daily? This could probably help with them.. I am not really sure what it is. It does not really look or sound like normal acne. Have you gone to a dermatologist? If so, what did they say? Okay, just researched BHA - and apparently that is salicylic acid. I've tried this several times without results. In fact, the murad program I just tried was based on this. I have seen a derm twice. The first gave me antibiotics which cleared me for a couple of months. After that he didn't change my program even though I got worse. I was just a kid, though - so I didn't push the issue. He should have done better for me. My second time I visited a derm for my scalp and he said I have psoriasis. He gave me two expensive perscriptions that did not work. Then Nizoral came to market (a fungal medicine) and it is the only thing that works on my scalp. It works right away. He did not mention my skin, but he seemed like he was in a hurry. I do believe that my skin and my scalp may be related. I have a family history of susceptibility to fungal infections. My son had one recently in his digestive system, which we cured with a seven day course of diflucan and no sugar or fruit juice all summer. The key to exfoliation is: Gentle! If you make your skin inflamed and raw in an over-aggressive exfoliation attempt, naturally you'll break out more. I myself use the baby's hair brush method for exfoliation. I also use a spinning electric toothbrush with my sensitive skin cleanser. That's gentle enough to do daily. AHA should work, but it does take time. It won't clear your comedonal acne (that's what you have) in a week; it could take a month. AHA in the form of Aqua Glycolic's toner or Alpha Hydrox' various formulations, or other such 10% glycolic formulations could make a big difference for you if you use them consistently for at least a month. Me personally, I found Avon's Anew Clinical Advanced Retexturizing Peel (10% glcyolic toner) cleared up the majority of my skin colored bumps. I also used the baby's hair brush method of exfoliation and that really helped, too. Exfoliating has never helped me. Being rough on my skin makes it angry. I've tried aha and it didn't do anything for me. It just felt weird on my skin and made it shiny. Is BHA similar? I am reviving this old topic to comment that I am trying a new treatment. I am using Fungicure soap on my face twice a day. I have photos posted in my gallery.